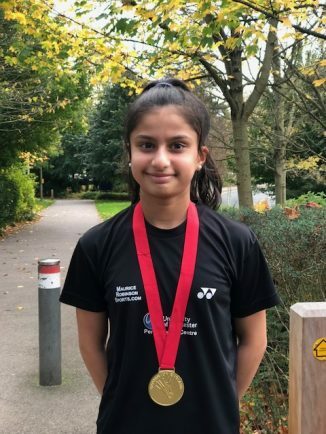 BARNT Green teenager Aditi Bhat is celebrating a string of victories which have rocketed her up the national rankings. The 13-year-old, who is a Year 8 pupil at King Edward VI High School in Edgbaston, is currently ranked 11 in England at under-15 level, a year young for her age-group. She led her school’s under-15 badminton side to an emphatic first-round victory in the national School Games Key Stage Three competition. Aditi, who is also the Worcestershire under-15 champion, won all her matches against opponents from King Edwards Girls’ Grammar, Camp Hill, Bishop Challoner Catholic College, King’s Heath and the University of Birmingham School. A month ago, she pulled off one of her most prestigious victories so far, taking the gold medal in the Girls’ Singles Under-15 Gold tournament at Bath and now has her sights set on the National Championships in June next year. “We are extremely proud of Aditi and delighted to hear of her success at such a high level,” said Ann Clark, principal of King Edward VI High School for Girls. Aditi started badminton four years ago, aged nine at Barnt Green Sports Club with Reggie Baker and chief coach Andy Hartley supported by Anthony Bowman and Tony Gardner. Spotting her dedication and potential, they encouraged her to enter junior tournaments and despite her diminutive size, she has won Worcestershire age group titles two years in a row. She now trains six days a week, including at her school badminton club, plus high-intensity on-court workouts and strength and conditioning sessions at the University of Worcester Performance Centre each Tuesday. As Aditi has now reached the elite Gold Standard in her age group and cannot play in the lower level events, she has to play a number of under-17 tournaments to keep up her ranking. This has broadened her experience, providing particularly tough competition and she recently took the silver medal at an U17 Silver Standard tournament in Liverpool after knocking out the top seed. “I’ve loved badminton ever since I took it up because it’s great fun and really enjoyable” said Aditi. “I’m quite small, at only five feet tall, but I often beat people twice my size thanks to good technique and being really determined.